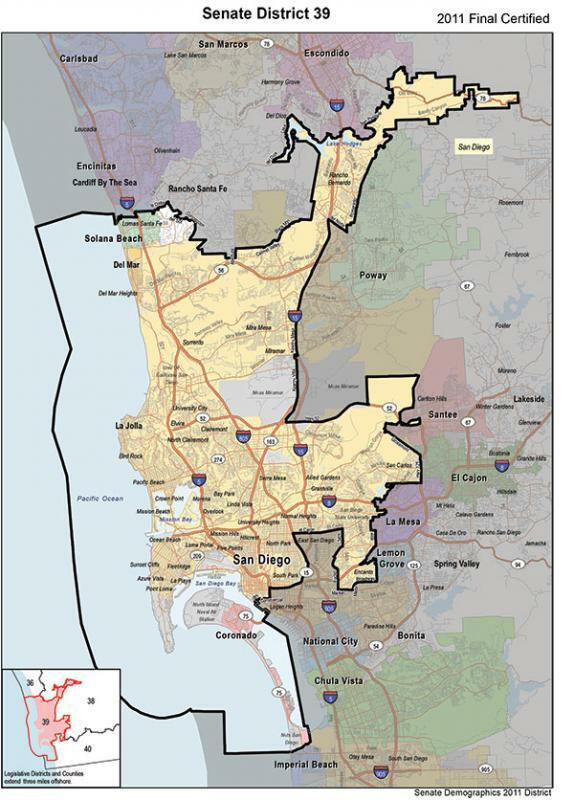 The 39th Senate District is located within San Diego County and includes most of the City of San Diego north of SR-94, the coastal cities of Coronado, Del Mar, and Solana Beach, and parts of unincorporated Rancho Santa Fe. The district overlays many of the same communities represented by Assembly Districts 77, 78, and 79. The district is highly urbanized and contains the central economic hub of the county, downtown San Diego, as well as regional parks, lakes, and open space preserves. SD 39 is characterized by its commercial, business, and high-tech research industries, government center, major universities, naval and military operations, port and airport operations, tourist attractions, recreational beaches, and environmentally sensitive coastal areas. It includes a highly diverse region of ethnic enclaves including communities with high numbers of Asian and Pacific Islander individuals, a large LGBT community, and a wide range of socioeconomic levels. Not sure if you are in the 39th Senate District?